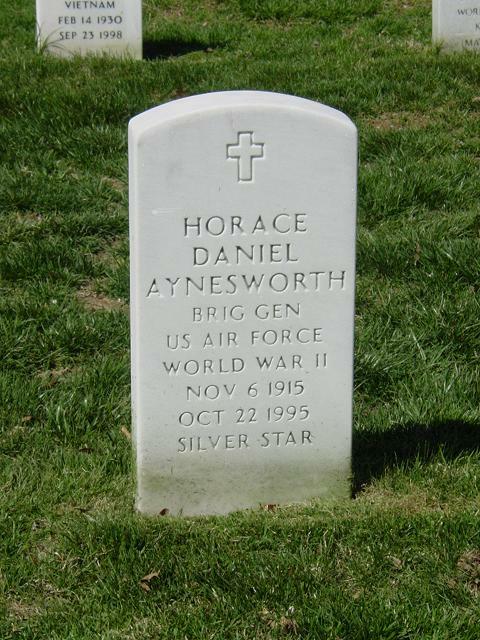 Horace D. Aynesworth, a retired Air Force Brigadier General who directed US reconnaissance operations during the Cuban missile crisis, died Sunday, October 22, 1995. The Sun City resident was 79. He was born in Childress, Texas, and entered the Army Air Corps in 1936. Highlights of his military career included flying 32 combat missions as commander of the 454th Bombardment Group during WWII. He became an Army Colonel at age 28. During the Cuban missile crisis in 1962, he was commander of the Tactical Air Reconnaissance Center at Shaw AFB, South Carolina. His medals included the Distingusihed Flying Cross, the French Croix de Guerre and the National Defense Service Medal. After his retirement in 1968, he sold homes for the Del Webb Corp until 1983. Survivors include his companion of 7 years, Vinetta Corcoran; sons, Daniel and Peter; sister, Susan Board; 3 grandchildren; and 2 great-grandchildren. Full military honor services will be held at 11 am Thursday at Arlington National Cemetery. Memorial contributions may be made to Hospice of the Valley, 1510 E Flower St, Phoenix, AZ 85014. Arrangements are being handled by Best Funeral Services. General Aynesworth was born at Childress, Texas, in 1915. He attended West Texas High School in the nearby town of Canyon. He received his higher education at West Texas State College, also in Canyon, and the University of Texas at Austin. An aviation enthusiast from boyhood, he enrolled in the summer of 1936 as a flying cadet in the U.S. Army Air Corps. He completed flight training at Randolph and Kelly fields in San Antonio and was commissioned a second lieutenant in the Air Corps Reserve June 30, 1937. Lieutenant Aynesworth was serving as aide-de-camp to Major General Millard Harmon, commanding general of the Second Air Force at Fort George Wright, Spokane, Wash., when World War II broke out. He was transferred to Davis-Monthan Field at Tucson, Arizona, wwhere he performed a succession of duties finally becoming commanding officer of the 39th Bombardment Group at that station. It was as commanding officer of the 454th Bombardment Group, a 15th Air Force unit in Italy, that Colonel Aynesworth won the Distinguished Flying Cross, the Silver Star Medal, and the Air Medal with three oak leaf clusters. Military Division, Military Liaison Committee to the Atomic Energy Commission in Washington, D.C., a position he held until February 1951. For the next year and one-half, Colonel Aynesworth was deputy chief of staff for operations, Headquarters Armed Forces Special Weapons Project in the Pentagon. He then attended the Air War College at Maxwell Air Force Base, Alabama. The colonel spent the next two years in Alaska as inspector general of the Alaskan Air Command and then as commander of Elmendorf Air Force Base. From August 1955 to August 1958, Colonel Aynesworth held the position of deputy assistant for Atomic Energy at Headquarters United States Air Force in Washington. He later became deputy commander, Field Command, Defense Atomic Support Agency at Sandia Base, Albuquerque, New Mexico. In August 1960, General Aynesworth assumed the duty of commander, 837th Air Division, Shaw Air Force Base, South Carolina. With the deactivation of the 837th Air Division in February 1963, General Aynesworth was named as commander USAF Tactical Air Reconnaissance Center, with his headquarters at Shaw Air Force Base, South Carolina. General Aynesworth is credited with flying 32 combat missions with a total of 201 combat hours during World War II. He has amassed approximately 4,000 hours flying time in a variety of aircraft.